Massachusetts is home to 142 dairy farms and 8% are in Essex and Middlesex Counties. Supporting your local dairy farmers is easier than you think! Dairy farmers are considered the “anchor tenants” of the region’s farmland base. Only 2% of the farms in the state are dairy farms but they steward 22% of all land in farms and account for 10% of the region’s farm product sales (Manomet Center for Conservation Sciences and 2012 Ag census). On average, a farm with 100 cows supports 200 acres of crop land, woodland and pasture. Successful dairy farms keep our landscape open and support important farm services, like equipment repair, that are important to all farms in our region. A recent study by American Farmland Trust, entitled Increasing Local Milk Processing Capacity: Benefits to Pioneer Valley Consumers and Communities, describes the importance of the dairy industry, the challenges of achieving profitability on New England dairy farms, and the potential impact of an investment in infrastructure for dairy processing. Dairy farming is a 7 day-a-week/365 day-a-year job and the health and comfort of their cows is a top priority for our farmers. Learn about dairy farming from the farmers themselves. Video’s about Massachusetts dairy farmers. More video’s about Massachusetts dairy farmers. Great Brook Farm is in Carlisle, MA! Cabot butter is made in West Springfield, MA. With the help of the New England Dairy Board we now have access to a mechanical milking cow to educate our community about the importance of dairy cows and how they bring us milk. Northeast Harvest is willing to Rent out Nellie to have at your fun farm event! 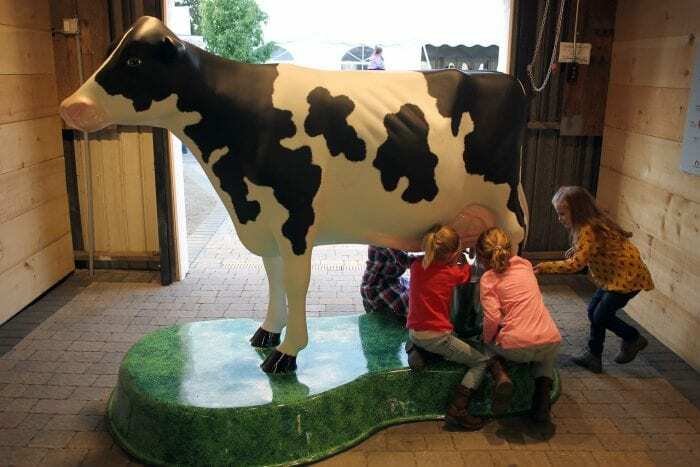 To extend the learning experience teaching kids where milk comes from. Call 978-887-5000 to inquire. The dairy is proud to say that they raise their cows from calves and maintain a high quality herd. They grow their own feed ensuring the cows give the best possible milk. Dunajski Dairy does not sell to the retail market but does sell wholesale and you can be sure to find the “Pure Country” brand in many stores. Shaw Farm has been in operation since 1908 and is now in its 6th generations of the Shaw family. In 1908, Henry Ford introduced his Model T Ford, the nation celebrated its first official Mother’s Day, and Mark Loran Shaw, Sr., purchased a piece of land that most people thought to be useless. Shaw purchased the first parcel of land on 195 New Boston Road where he built a home, a barn, and a milk house. In 1912, Mark Jr. began driving a milk wagon delivering to nearby customers and to this day, Shaw Farm continues home delivery – however in their well-known fleet of milk trucks and not the horse-drawn wagon of years past. The challenge of the 1960’s would become supermarkets. Home delivery of milk, long the backbone of the business, began to decline as consumers were attracted to the one-stop convenience of these new markets. Committed to the future of the farm, Warren Shaw found his strategy in on-farm sales by providing a simple, inexpensive way for local folks to stop by the farm and pick up their milk. It started as an honor system but eventually grew into the Shaw Farm Store. As sales grew in the late 70’s and early 80’s, a market had to be found for the cream. The answer to this was to make ice cream! Today there are over 75 varieties which they sell to retail stores and also at the ice cream stand that was built in the late 90’s. Shaw Farm takes pride in making sure their cows receive only the best feeds available. To ensure this priority, they grow the feed themselves on over 150 acres of land which is farmed to grow high quality grasses. Shaw Farm teams up with Wilson’s Farm to farm 80 acres of their land to grow the high quality corn silage. Wally Beidron is the farm’s herdsman and is part of the 3rd generation to make a career at the farm and has worked since the age of 8 years old. He cares for the cows as if they are his own children. Wally is also responsible for breeding the cows which is vital to their milk output. Each cow gives birth every year and he oversees the delivery of their calves. Dancing Goats Dairy is a small goat dairy located in Newbury, Massachusetts. It specializes in artisan batches of fresh and aged cheese, goat milk caramel, goat milk fudge and handcrafted soaps. The herd is raised on open pasture which gives the cheese a mild flavor that changes with the seasons and the soaps are crafted using only pure essential oils. The owner and cheesemaker, Erin Bligh, fell in love with the rustic simplicity of French cheese while studying abroad in Rennes, France. From France she took a job as a Kidding Intern at Consider Bardwell Farm in Vermont. Erin spent about a year in Vermont, learning how to birth and milk goats, how to run a farm and then several months in the cheese room as an apprentice. Returning to Massachusetts, Erin worked for Tendercrop Farm. In 2013, she began her kidding season with a herd of five goats after renovating an old farm outbuilding into stalls and a milk room. By 2014, her herd had grown to milking seven and by 2015 to milking fourteen. Newburyport Farmers Market located at The Tannery Marketplace, Newburyport, MA on Sundays 9am-1pm during summer. Cape Ann Farmers Market located at Stage Fort Park, Gloucester, MA from June 2 – Oct 13, 3pm-6:30pm. Boston Public Market located at 100 Hanover St, Boston, MA on Wednesdays & Sundays, 8am-8pm. Richardson’s Dairy Farm is located at 256 South Main Street in Middleton, MA. The farm and ice cream operations are currently managed by the 8th and 9th generations. In 1695, David Richardson moved from Woburn to Salem Village, which is now part of Middleton Massachusetts. David started Richardson’s farm as it is known today and the Richardson’s have milked cows in Middleton every day since his arrival (more than 300 years). For the first few generations in Middleton, the Richardson’s were most subsistence farmers: milking cows, raising chickens, vegetables and any other food needed to sustain the family through their normal daily activities. By 1900, the farm began growing with more and more cows. Hazen K. Richardson was in charge. With his two sons, Ben and Hazen M, they started bottling, selling and distributing milk in 1917. The farm expanded to over 1,000 cows by 1934. In 1952, Ben and Hazen Richardson set out to make “One Perfect Ice Cream.” A decade later, their ice cream stand became a local favorite with over 50 flavors to choose from (a remarkable achievement at the time). In 1978, Richardson’s launched their wholesale business, delivering ice cream to other dairy stands, grocery stores and restaurants throughout New England. Their dairy farm, ice cream, milk and delivery staffs have been here for years. Their scoopers, mostly students, come back summer after summer, and they take pride in Richardson’s, care about the place and feel a sense of ownership, treating each customer like family. Today, the flagship ice cream stand in Middleton, Massachusetts remains on the dairy farm. The ice cream stand now has an all season dining room, complete with outdoor tables and fountains. Sheep, chickens, ducks and even a rooster have joined the 370 cows. At the adjoining Golf Country, customers enjoy hours of fun at two miniature golf courses, batting cages and a driving range. Customers both appreciate and enjoy the immaculate grounds and greenery. Richardson’s second ice cream stand at Jordan’s Furniture Superstore in Reading, Massachusetts has been a larger-than-life addition to their family. Appleton Farms consists of a 1,000-acre pastoral landscape encompassing rolling grasslands, grazing livestock, stonewalls, extensive forests and historic farm buildings 25 miles north of Boston. Founded in 1636 by Samuel Appleton and farmed by nine successive generations of Appletons, Appleton Farms is the oldest continuously operating farm in America. Over the last 14 years of ownership, the Trustees have restored much of the farms’ centuries-old infrastructure and developed a suite of sustainable agricultural enterprises, including successful grass-based beef and dairy operations, a 550-share Community Supported Agriculture (CSA) program, and a farm store that sells the farm’s own beef, cheese, milk and yogurt products. Appleton Farms has a new on-site dairy processing facility. They are bringing dairy products to the “community doorstep” by establishing a Jersey milking herd and by creating an on-site dairy farm store to sell milk and other products to the public. The store offers farmstead milk, cheese, butter, yogurt, beef, and eggs. Jersey milk is creamy and more nutritious than the milk generally found in the grocery store. This is due to the higher fat and protein content and also because the Jerseys cows at Appleton Farms spend much of their time in the pasture. Therefore, the more grass they eat, the healthier their milk. Milk from grass-fed cows has more vitamins, more conjugated linoleic acids, and high omerga-3 content than milk from grain-fed cows. The farm store sell skim, 1%, and whole milk – both homogenized and non-homogenized, which means the cream separates and rises to the top. A half-gallon of Appleton milk costs $4.25, plus a $3 deposit for the glass bottle. The $3 deposit is waived for customers who return a previously purchased milk bottle, thus making a half-gallon a farm-fresh milk VERY AFFORDABLE! Mark and Tamma Duffy don’t run your standard spread, and they didn’t come to dairy farming by the beaten path. Mark and Tamma are first generation farmers. Their daughter Marlow, a recent graduate of the University of Vermont, is working the farm with them, so they are now moving into the second generation. Their two younger sons, Christopher and Blake, seem to have caught the dairy-farming bug as well and help out as much as possible. Charlie and his family run Tully Farm in Dunstable, Massachusetts. They have 350 acres, 125 milkers and about 125 head of young stock. Charlie’s great grandfather was born on their family farm in 1873, and he and his parents were raised there. Dairy farming is simply in their blood. For the Tullys, there’s no such thing as retirement. Charlie’s grandfather George is in his 90s and still works in the barn every day. The family recently celebrated a delightful Christmas. Charlie had learned that the tractor his grandfather used decades ago was available for sale in a nearby town. It was originally manufactured in 1939, and the Tullys decided it would be great to purchase the tractor, rebuild it inside and out, and give it to George as a Christmas present. The entire clan and many friends were gathered in the Tullys’ home when Charlie and other family members left, only to return a few minutes later proudly driving the very 1939 tractor that had done so much work for the family for so many years. Grandfather George didn’t even need to see the tractor to know what it was. He recognized the sound of the old beauty right away and told everybody on the spot what it was. That was a Christmas to remember. Like so many farm families, the Tullys operate a second business on the side. They have logged a portion of their untillable land during the winter for decades, and they then haul the lumber off to distant sawmills. This helps blunt the bite of an uncooperative milk market and provides a secondary revenue stream for the family. Artichoke Dairy gets its name from the river that flows past its barns and pastures in West Newbury. The dairy’s owner is Bruce Colby. For more than twenty five years, Bruce labored to keep his business afloat, as small farmers do. All of the milk his cows produced was collected by a large, local milk cooperative. The price for his milk was determined in part by market place demand, and in part by federal pricing regulations and formulas. About seven years ago, Colby’s bottom line took a turn upward when he left the conventional dairy market and began selling raw milk directly to consumers. The public interest in raw milk is steady and growing, and so is Bruce’s business. In accordance with state law, customers come to the dairy barn to make their purchases. Many customers come regularly. Some travel from their homes in Gloucester, Winchester, and Boston because of the scarcity of raw milk dairies in this part of the state. In addition, Colby sells milk to a few other small food producers, including an Amesbury cheese maker. With a milking herd of twenty, Colby has been enjoying the independence of meeting the need of the raw milk market.